My disappointment in this book is making me feel physically ill. Forgive me for the clichéd teacher-like term, but The Forsaken had so much potential. I went in with so much excitement and anticipation, and came out feeling like the book had physically drained me of every ounce of perseverance I possessed. I feel like I’ve been cheated out of what could have been an incredible read. 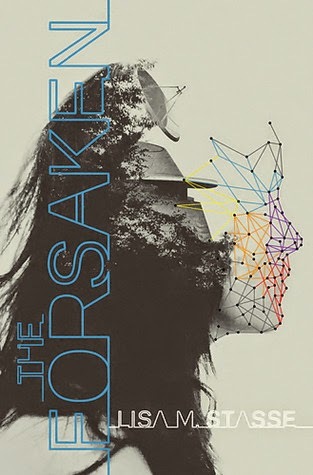 Even with similar concepts to The Hunger Games and The Maze Runner, there were so many unique aspects that could have made The Forsaken an unforgettable story. But something just wouldn’t click. Overall, I fount the plotlines jagged, resulting in random, unsatisfactory climaxes and confusing twists that were generally quite unnecessary, and had no contribution to the core storyline. Everything seemed to happen in random bursts of energy, and the experience of reading it was almost like driving down a dirt road in a Toyota – bumpy, unpleasant, and often invoking feelings of slight nausea. For me, the main problem area of The Forsaken was character development. Perhaps if there had been a single character in the book that I could have related to, reading it would have been much more enjoyable. David was flat, Liam was weirdly soppy, and Gadya was seriously bipolar and possibly a sociopath. I found it extremely difficult to connect with Alenna. If she had any strong personality traits other than being impulsive and intensely loyal, they were very badly portrayed. Despite the entire book being narrated from her perspective, and her frequent italicized thoughts (which I found very annoying for no apparent reason), by the time the novel ended I felt like I barely knew her at all. She was transparent, fluffy and annoying, and I couldn’t understand her logic in about 99% of the situations she faced. My last comment is on the insta-love that appeared between Alenna and Liam. I cannot stand love stories that start with the love-at-first-sight “I-spotted-him-leaning-against-the-tree-and-couldn’t-look-away” garbage. The fact that Alenna couldn’t get her priorities straight made me want to rip my hair out. She wants him, swears she won’t touch him and will focus on surviving instead (I actually respected her for about three seconds when she made this decision), and then chases after him like an overexcited puppy. She’s known him for three days and then decides to risk her life for him, claiming it’s love. That’s not love; that’s stupidity and desperation. I really wanted so much more from this book. Perhaps my high expectations at the beginning ruined it for me – I don’t know. It was a struggle to finish, and looking back I really do wish that I might have enjoyed it.